In yoga and other forms of movement, the core is often understood to be a set of structures and tissues located in the abdominal area. If I ask you where your core is, chances are you will point to your belly. But what I have learned is that the core is so much more than just abdominal muscles, and using it in our practice can bring so many incredible benefits. I included the dictionary definition of core at the top of this post to get us thinking about what the core could mean in a wider sense. First we have “a central and often foundational part…” The interesting point here is to think of our core as foundational. In asana practice, the core is often underused or misused—meaning we lose out on its power and support in our poses and movements. Most of the time, we forget or don’t even know that the core is the foundation of our body. Partly this is due to a restricted identification of our core as the belly muscles only. If we could broaden our understanding of the core, we would see that it is actually a set of interrelated muscles and structures that run along the inside of our entire body. This “core line” includes what we traditionally think of as the core in the belly, but also extends to the inner muscles of the legs, the arches of the feet, and the deep spinal support muscles. This core line is the foundation of our body because it holds us up from the inside, providing support to our bones and allowing us to align ourselves optimally in space. So, how would we move if we really did believe the core was the foundation of our body? What would our poses feel like if we were able to ground them in the core of our body? The next part of our definition is “a basic, essential, or enduring part…” All three of these adjectives have something to offer our exploration of the core. Anatomically, the most basic of movements begins with the core line—our spinal cord was the first structure to develop evolutionarily, and its primary purpose is to get us moving, so it makes sense that the muscles that run along it should be used in all our movements. The core line is essential to healthy, stable movement. If our yoga asana practice is truly about bringing us greater strength and flexibility, then the core line is the way that is going to happen at the deepest physical level. These muscles provide a solid core to the most precious part of our physical organism (the spine), and at the same time give us a sense of suppleness and ease in our body that is a fundamental part of being human. Finally, I take the “enduring” part of the core line to be that it provides us with a sense of physical centeredness and resilience. Also, if you’ve been to my classes, you’ll know that working with the core line builds a tremendous amount of physical and energetic endurance. As my teacher says, activating the core line turbo-boosts your yoga practice because you’re working on both the inner, deeper muscles and the outer ones at the same time. The last two parts of our definition point to the same aspect of the core line. It is the essential meaning and the inmost or most intimate part of our physical body. In the yoga tradition, the spinal cord holds the central channel, or sushumna nadi. This channel is the unconditioned space of our awareness, and the very essence of our energetic body. The core line, in supporting the spinal cord, wraps around and holds sushumna (as well as the chakras that run along it). When we connect with the core line, we move towards our own centre in a direct and embodied way. To feel into the core line and move from it is to bring yourself inward and connect to your truth and your deeper being. It is, quite literally, a way of being intimately in touch with the innermost part of who you are. 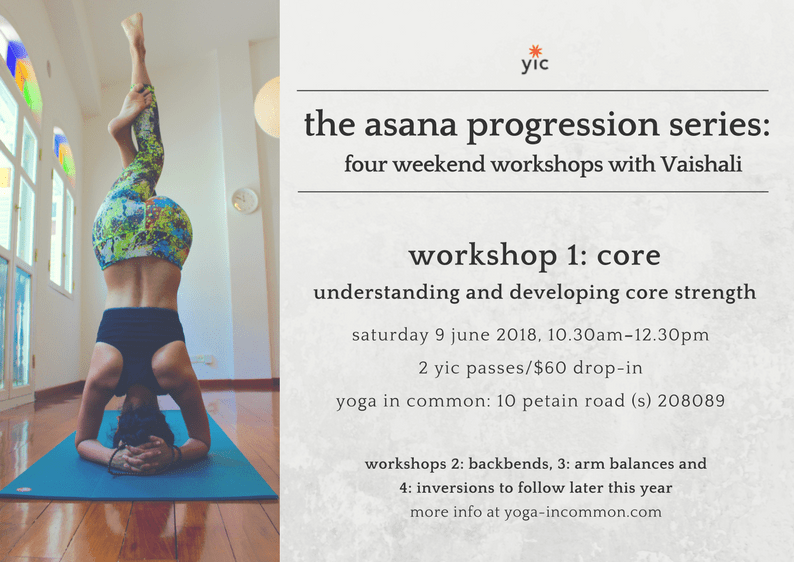 To learn more about your core body, join Vaishali for The Asana Progression Series: Core Workshop, on Saturday 9 June at 10.30am. More information here.